Greetings from the big, old blue! 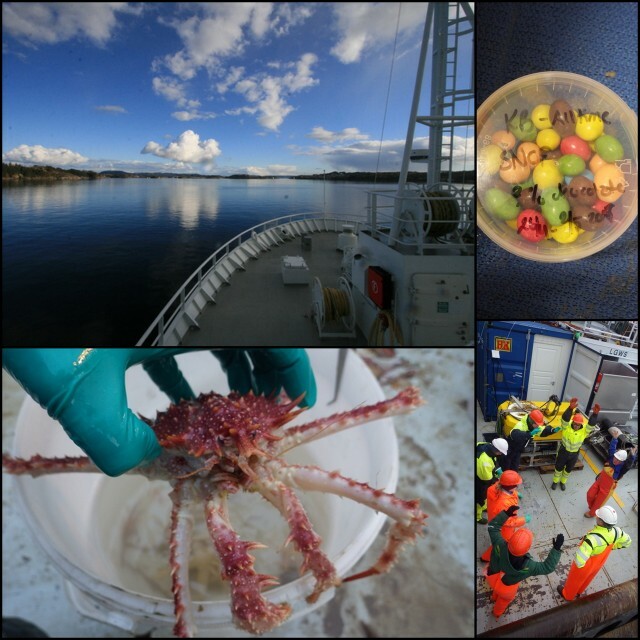 We don’t have much internet out here, so updates will be sporadic – but here’s the tale of the first half of the two cruises that the Invertebrate Collections people have stowed away on this spring. 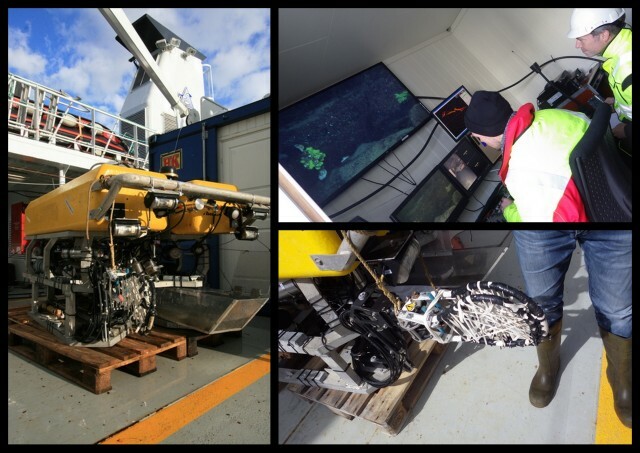 The current cruise is part of the SponGES-project that is being coordinated by the University of Bergen, Norway (prof. Hans Tore Rapp). 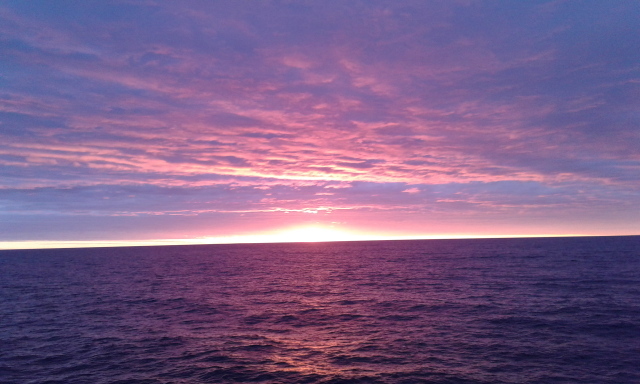 We are currently midway in the six-day cruise (26th of April to 2nd of May), and are presently to be found at 59°63,000 N, 04°42,000 E – there are mountains on one horizon, and open ocean on the other. 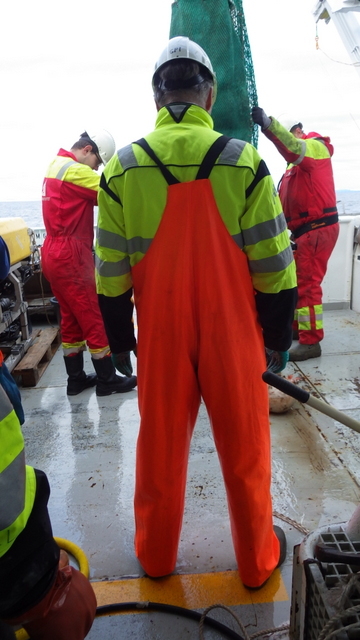 After a night of muddy (clay-y) sampling, the majority of us are relaxing and eagerly awaiting lunch, whilst some of the sponge-folks are huddled inside the big, blue container on the deck, surveying the sea floor with the ROV Aglantha (occasionally cherry-picking sponges with fancy scoops). At present we are at station #33; it has been three busy days so far! This is the first trip for all of us on the “new” R/V Kristine Bonnevie (formerly known as “Dr. Fritjof Nansen”, but that name has passed on to the new Nansen vessel), and we’re thoroughly enjoying it. The crew is amazing, the food is delicious, and the samples keep coming – what’s not to like? 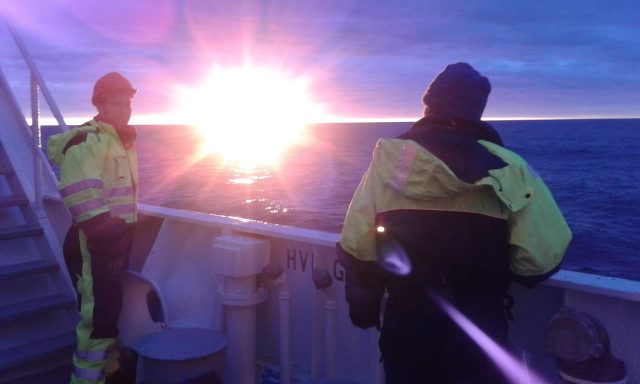 Even the weather has been good to us most of the time – though we have sprouted quite a crop of anti-seasickness patches onboard by now! 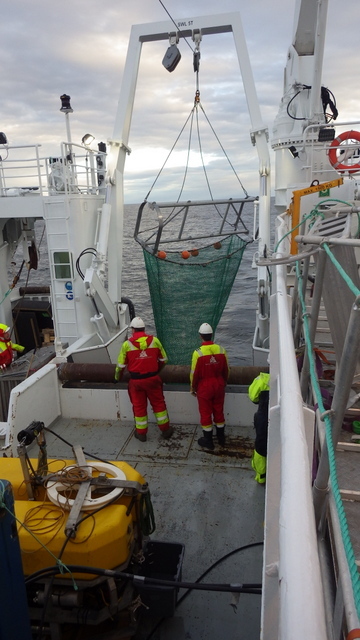 In addition to the ROV, we are using van Veen grabs, Agassiz trawl, plankton net, and RP-sledge to collect fauna. We also stumbled across hundreds of meters of lost fishing line when diving with Aglantha – the operators were able to catch an end of it, and it was dragged onboard to be discarded properly. 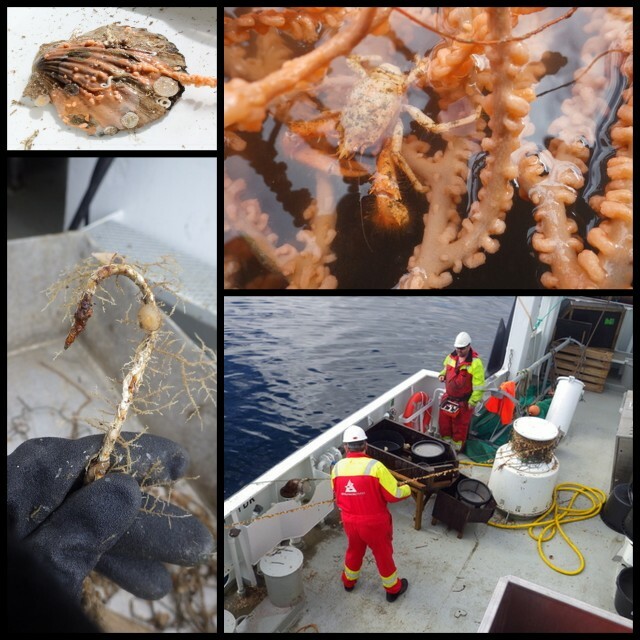 The rope was heavily colonized by sponges, hydrozoa and mussels, so we got a “bonus sample” from that – and we got to clear away some marine pollution. Win/win! 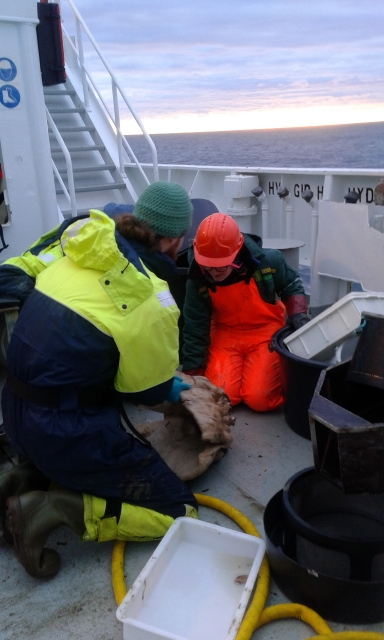 Old Fishing line being removed – and samples taken from it! My main incentive for being onboard is to secure ethanol-fixed (=suitable for DNA work) material from locations that we have either none or only formaldehyde fixed. This will then become part of the museum collections – and we will have fresh material for DNA barcoding through NorBOL. 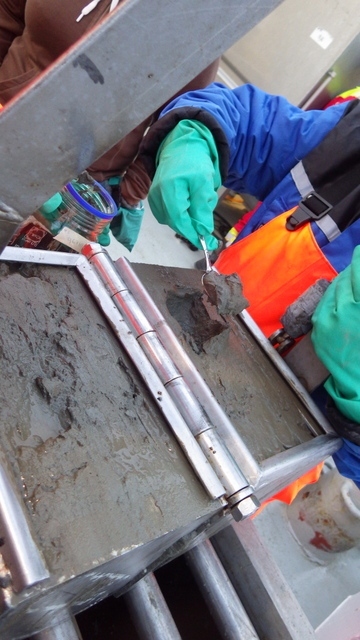 The art of washing grab samples – get rid of the mud, keep the animals intact! 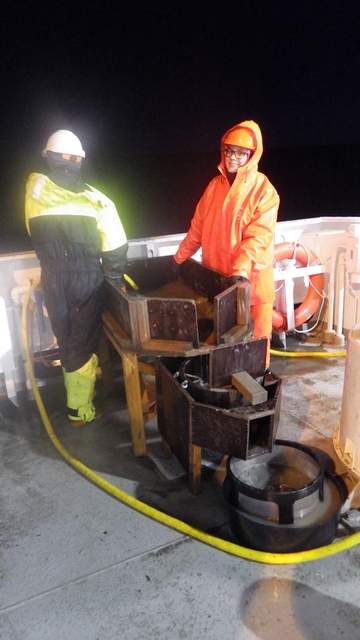 The samples we are collecting are gently and carefully treated on deck before being bulk (i.e. unsorted) fixated in ethanol. 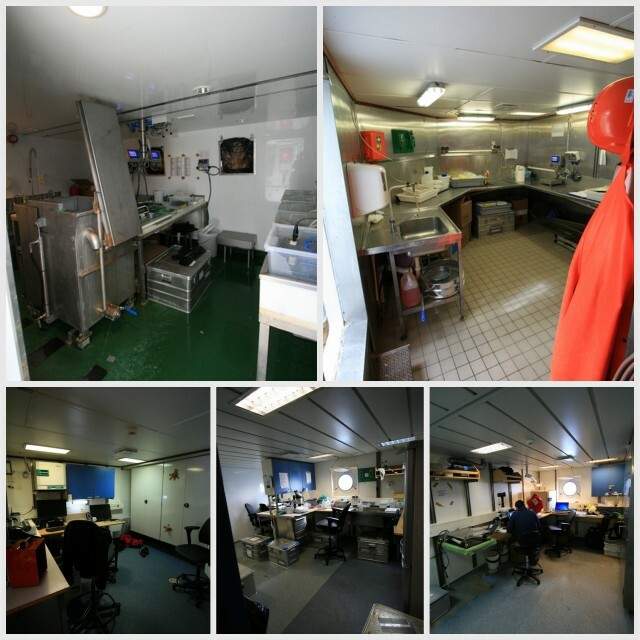 There is lab space onboard, but we don’t have the time to do much sorting here. It will be exciting to see what we find once we get back to the lab and begin sorting it! But before we get to that, we have three more days with SponGES, and then we go on to the next cruise, which will also be with Bonnevie – this time we’re heading up and into the Sognefjord. This entry was posted in About, Current projects, Field work, HYPNO, NorAmph, NorBOL, PolyNor on April 29, 2017 by katrine.